Artificial intelligence conference and expo hits Boston with three days of case studies, networking, and workshops. At the Healthcare Packaging Expo, new automated solutions offered more efficient packaging, traceability, and quality control for pharmaceutical packaging. As an integrator, HighRes Biosolutions intimately knows its customers' needs, as the biopharmaceuticals industry looks to save money and speed testing with robots. 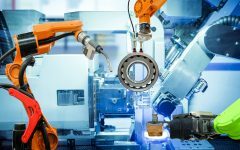 How to match the right robot arm to the right market or business challenge. Automation in the laboratory space requires precision and reliability, but also flexibility, says Peter Harris, CEO of HighRes Biosolutions. A growing number of medical facilities and centralized internal pharmacies see efficiency gains as robots in hospitals perform delivery and packaging assignments. RoboBusiness will be presenting the Robotics & AI Summit at PTC's LiveWorx '18 event in Boston in June. We'll be discussing how the latest in automation can help manufacturing be competitive. AI funding made up many of the transactions in 2017's penultimate week. Robotics Business Review's weekly roundup also looks at deals around sensors, warehouse automation, surgical robots, and more.